"WTF?! Who told this guy he could write reviews?! Hey, baldy! My pawless dog can write better!" Deadpool falls like an anvil in the latter…in an extremely good way. It’s quite possible that someone in Warner Bros.’ legal department is trying to cook up some way to sue 20th Century Fox and Marvel for copyright infringement, as Deadpool is practically a live action appropriation of a Looney Tunes cartoon. However, instead of a smart alec-y hare, we get smart alec-y with no hair “Wade Wilson” (played by Ryan Reynolds, returning to the role he first made [in]famous in X-Men Origins: Wolverine (2009)), a merc with a mouth and a smidgen of decency who reluctantly avails himself of an offer to cure his aggressive cancer; subjecting himself to a series of "treatments" that trigger his latent mutant gene and, ostensibly, become a super-hero. Things don’t go as planned due to the sociopathic ministrations of the project’s leader, “Ajax” (Ed Skrein, Game of Thrones; The Transporter Refuled). With the (reluctant) help of X-Men “Colossus” (Stefan Kapicic, Greg LaSalle, and Yeygeniy Kartashov) and “Negasonic Teenage Warhead” (Brianna Hildebrand), Deadpool fights to regain his humanity so that he may once again be reunited with his ladylove and equal, Vanessa (Morena Baccarin, Firefly; Gotham). The character doesn’t fare well in origin, but the character’s fans, who were up in arms at the manner in which Deadpool was previously depicted in live action, can cry in orgiastic relief. 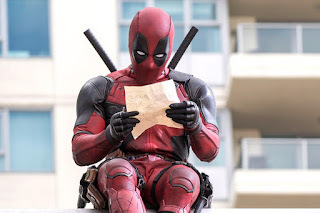 Here, Deadpool is the comics character come to life: he’s flippant, he’s deadly, he’s anti-heroic, he’s ADHD, he loves saying "chimichanga", he breaks the fourth wall, and he’s R-rated! As such, this is one of the fewest instances of a film interpretation staying true to its comic book source. Wade Wilson is not just the character in name only, and the also alliteratively-named Reynolds brings him gleefully to life in a redemptive performance that not only washes away the “sins” of Origins, but also pokes (much deserved) fun at his maligned performance playing another super-hero owned by Marvel’s Distinguished Competition. It’s perhaps his most relaxed and effortless role to date, but it’s not without its nuance. Deadpool is exactly what its advertising purported it to be. It’s a love story, a horror film, a super hero yarn, a buddy cop film, and a character study all rolled into a zany, madcap ball. But the kicker here is for a film whose protagonist is known for his annoying irreverence, it is a surprisingly well-crafted piece of art. By art, we’re not discussing the CGI (whose only weakness is the rendition of the mutant Colossus, which was somewhat distracting at time but worked on the whole), but rather the crafting of the story itself. For example, Skrein’s Ajax is not just a villain because the movie says he is. Director Tim Miller takes great pains to engender a visceral antipathy towards the character by use of pacing and camera angles; working to make Ajax’ villainy personal not only to Deadpool, but to the audience in general. Further, all the characters are interesting, including Karan Soni in a small but amusing role as a taxi driver with love problems, Nichelle Nichols look-a-like Leslie Uggams as “Blind Al”, Deadpool’s septuagenarian, ordinance savvy roommate with a lust for some ‘pool, and TJ Miller as Deadpool’s best bud “Weasal”. The film also features strong performances by two previous “Wonder Woman” contenders, the aforementioned Baccarin and former MMA Gina Carano (Haywire) as “Angel Dust”, Ajax’ right hand person, as well as Heldebrand as the gothic, snarky Warhead, who provides comic relief balanced with general character badassery. Tom Hokenborg a/k/a Junkie LX’s score is just as eclectic as the film it supports, and just as enjoyable. If there’s only one complaint, is that the film may not be madcap enough, but expect that the lunacy will be ramped up in the inevitable sequel. It does, however, manage to balance the gonzo with enough gravitas to push the story forward without getting mired by either extreme. In many respects, Deadpool is the answer to many films within its genre that take themselves a little too seriously, while at the same time experimenting with the storytelling and pushing the boundaries of acceptability while embracing its iconoclastic nature in celebratory fashion. Some may find it offensive, but no one can deny that in a genre that is dangerously approaching glut, it is very refreshing and, dare I say, surprisingly original. So jump into the rabbit hole, smuggle in a couple of chimichangas, and enjoy the experience that is Deadpool.